Jean-Paul Hébrart has been in charge of this estate since his father, Marc Hébrart, retired in 1997. 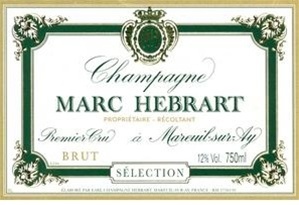 Marc Hébrart had been producing estate-bottled champagne since 1964, and since 1985 the estate has been a member of the winegrowers’ association called the Club des Viticulteurs Champenois (now called the Club Trésors de Champagne). While Jean-Paul had been making wine for several years under his own label, Jean-Paul Hébrart, he consolidated the two estates upon his father’s retirement, and now works 15 hectares of vines under the original family label of Marc Hébrart. Hébrart’s vineyards are spread over 75 parcels in ten different villages: Aÿ, Mareuil-sur-Aÿ, Louvois, Avenay Val d’Or, Bisseuil, Dizy, Hautvillers, Avize, Chouilly and Oiry. Viticulture here is raisonnée, avoiding synthetic treatments as much as possible, and parcels are vinified separately to preserve their distinct identities. Fermentation has traditionally been done in enameled steel tanks; Hébrart purchased thermo-regulated stainless steel in 2003, but he says that the difference in quality isn’t very pronounced. Since 2002, Jean-Paul Hébrart has been experimenting with fermentation in barrel for some old-vine parcels. The results have been promising, and they have ultimately led to the creation of a barrel-fermented cuvée called Rive Gauche-Rive Droite, the first vintage of which was 2004. Hébrart’s wines see a respectable amount of lees aging—in general, a minimum of 24 to 30 months for the rosé and Cuvée de Réserve, and 36 months for the Sélection—but he would like to hold them back for an even longer period of time. Financially, however, this is a difficult thing to achieve, and requires patience and careful planning. “My goal is to gain another year of stock within the next four years,” he says.